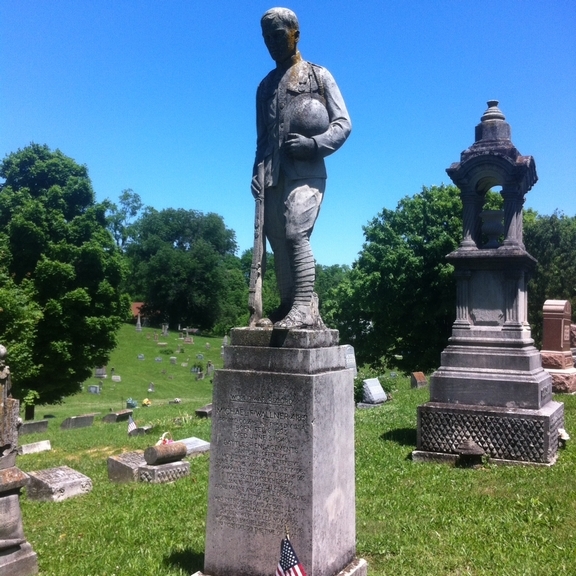 This statue honors Michael Wallner, a World War I Doughboy. The monument was produced in the Arena Studio in Bedford, owned by Francesco Arena. As a model for the stone, a young man was photographed in a WWI doughboy uniform with rifle and full attire. Arena's eldest son, Frank, used the photo to sculpt a 3/4-size model. Arena chose the great German carver, Fredrick Edler, to carve the statue. The Wallner statue is unique in that it is carved from variegated limestone. This stone consists of grey and buff shades mixed within the block. Michael Wallner served his country as a Private (Company A, 16th Infantry First Division). He was seriously injured by shellfire on July 20, 1918, and never fully recovered. He passed away 22 years later in the Veteran's Administration home in Marian, Indiana. There are 7 family members buried in this lot, including Wallner's parents, Michael F. Wallner Sr. and Mamie Akers Wallner.